How do you transfer files between your PC and your Android smartphone or tablet? Do you connect the device via USB to your computer to transfer the files? Use a file synchronization service that you have installed on your devices? Or something completely different? If you are looking for a dead easy way to transfer files from your PC to your Android device, you may want to take a closer look at qrSend. The program is available in app form for Android, and as a Java program that you need to run on your local system. The two programs interact with each other over a wireless network, so that you do not need to connect your phone or tablet to your computer when you want to move files from it to the device. Visit the Google Play store and install the qrSend application on your Android device. Open the developers website on your desktop system and download the qrSend program for Windows or other platforms. If you are using Windows, run the installer to install it. The installation integrates a new menu item to Windows Explorer that you can use to send files to your phone. So how do you get the files on your phone or tablet then? 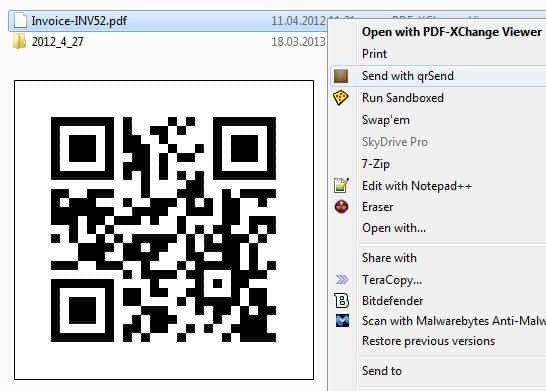 You right-click the file or files that you want to transfer and select the qrSend option from the context menu. This displays a qrCode on your system that you need to scan now using the application. Note that qrSend uses the Barcode Scanner app that you need installed on your phone as well for that. It will open Google Play on your phone or tablet if it is not installed so that you can install it right away. The selected files appear on the phone then so that you can use them there. Note that while it is possible to select multiple files for the transfer, it is not possible to send folders or mix files and folders. The files are saved in a qrSend folder by default, which you can change to the device's default download folder instead in the preferences. Windows users can remove the context menu entry again with a Registry file that the author of the application makes available on the official website. The qrSend app is not an alternative to AirDroid but if you only want to transfer files from your computer to your phone, it may be worth a shot as it is really easy once you have set up all the programs that you need for the functionality. Why install Java for this limited xfer program? Airdroid needs nothing more than your browser and is a free app that has ober features! I could see this being used at business presentations or conference centers. Sending one file to many devices at once would be nifty. Dumb question though.. is it actually packing the file in the QRcode or is it just creating a link to a file being stored on some unmentioned cloud service? From what I understand, it transfers the file over the local wireless connection to Android devices and does not use the cloud or any other proxy storage in between. qrsend is not working. showing pending transfer only. I use dropbox along with Dropsync :) and happy with them. But, I will definitely take a look at this qrSend. Hello, I am the author of qrSend. Thank you very much for featuring me on your website! I am currently working on an update for both the android application and the desktop client to enable transfers of any mix of files and/or folders in a single scan, as well as some improvements to the transfer process itself. Hopefully the update will be out by tomorrow. The updated Android application will notify you when you need to update your desktop client to allow for the new multi-file/folder transfer! “connect your phone or table to your computer” Whoops. Never heard of those new fancy tables that you can connect to your computer? J/K thanks for spotting the error.